Sydney has some quality parks for peace, tranquility and for everyone's enjoyment from picnics to walks, and even an opportunity just to rest, and even to read a quality book, or two. Although you have to be somewhat a fit person (not really, although this is most helpful if you are) then Elkington Park is your destination. It is just helpful if you are fit to some degree to handle the steep hill walk back up to Darling Street, especially on a hot day. Otherwise driving is the next best alternative. Great gazebo's and fresh floristry, and also being nestled right near the water makes this a perfect locale for a sensational day out with family and/or friends. An abundance of space for the kids to run around, and you have Dawn Fraser Baths nearby, just terrific. Also I love Gladstone Park. Any treats or food I buy at Balmain, especially on a gorgeous day weather wise I come here. Great for those lunches, picnics, time out with friends and even just lying down and enjoying the sun, and also glimpses of the Sydney Harbour Bridge. Sometimes the school kids play here under supervision. Still heaven. Centennial Park is just magical. I was fortunate to come here on a Sunday in August while I was in Sydney (after picking up something in nearby Paddington) and it was great that cars were actually banned from driving in and through the park on this given Sunday. It was great to be able to walk around in the open, and great to just sit and/or lie there among the trees. Great for families too. King George Park in Rozelle is great for those sporting events, and I love the long jump pit; just takes one back to their past, and the kids love creating sandcastles in this athletic pitch. Like the new trail to the bay run, and also the new children's playground created after the second bridge was completed is a real treat. And also nearby Five Dock Park has an abundance of space, and plenty of opportunities to sit in the shade under many well coveted trees. Of course, cannot forget about Hyde Park or the Botanical Gardens. Both beautiful and spacious parks. Love it how art comes alive at Hyde Park, and how it is the mecca of a few of Sydney's cultural and sporting events, and the botanical gardens is airy, spacious and peaceful. Beautiful sanctuaries. 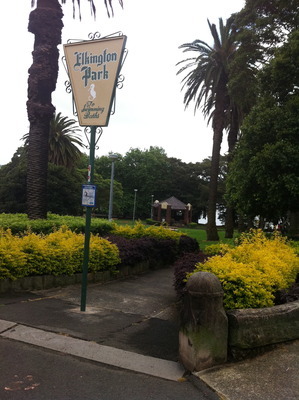 Also Pirrama Park in Pyrmont came to mind just now. Great bike riding trail; an abundance of play space and fantastic sand castles for the kids, as well as fantastic views; not to mention great fishing areas.